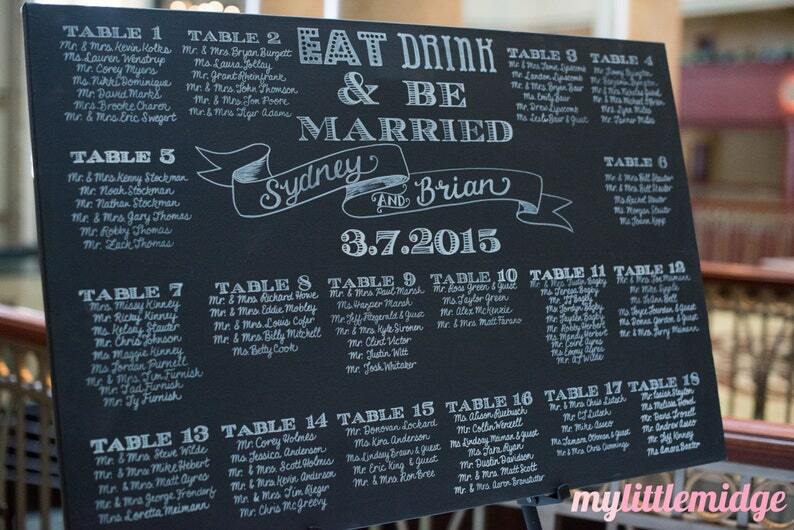 Hand lettered wooden seating chart with custom wood frame in honey finish. *TURNAROUND TIME: Purchasing this listing secures your spot in my order queue--you DO NOT have to give me final guest list until 2 weeks prior to ship/completion date! Please ask if you need any clarification. Most brides book several months in advance to reserve their place in my order queue, so please check if the date is available before purchasing, and I will do my very best to accommodate your timeline. *GUEST LIST: When sending me your FINAL guest list, please double check to make sure all information is correct, and names are spelled correctly AND listed the exact way you would like it written (alphabetized or by table number). Once I begin work, I will be unable to make any changes. Due to the fact that I create these so close to the event date, I will be unable to make any changes whatsoever to the sign once it is completed. Prices are for guests to be written together (Mr. & Mrs. John Doe), unless specified as being counted individually (Mr. John Doe, Mrs. Jane Doe). Individual guests (last part of dropdown menu, either marked "individual" or "individ." means that the seating chart will have each guest written individually. This is subject to an additional fee for the additional work, therefore the price increase. -CANVAS: 24x36 inch stapled back canvas, painted in chalkboard paint. Canvases are lighter, and do NOT need to be framed, although you certainly can do so. These will need to either lean up against something large or be placed on an easel. -WOOD: 24x36 inches (default, if you have your own frame, I can cut it to your size--please check first), chalkboard painted on 1/2" sheet of pine board or MDF, this WILL NEED TO BE FRAMED. The sign is thin to keep shipping costs down, and will need to be placed in a frame. You can purchase a standard 24x36 frame and the sign will easily fit inside of it. 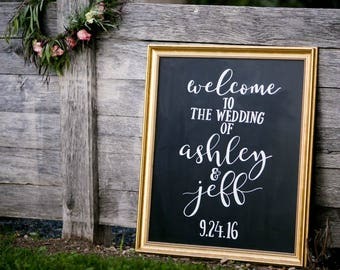 -WOOD WITH FRAME: You will receive a wood sign (mentioned above) with a rustic stained wood frame pictured here in this listing: https://www.etsy.com/listing/198382720/personalized-hand-drawn-painted-wedding?ref=shop_home_active_4 The sign will be fully assembled, and very sturdy, so you may lean it against something or place it on a large easel. *SHIPPING: Your sign, regardless of material, will be wrapped in cardboard and then in brown mailing paper. All wood and wood framed signs will also have additional bubble wrap for protection. 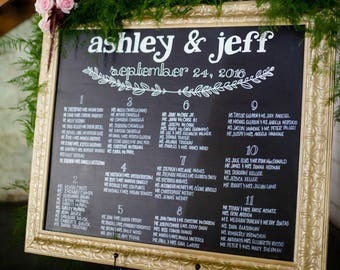 *ALL WEDDING SIGNS will need to be approved before mailing out. I will send over a photo the day before the expected mail date for you to approve. Failure to answer/approve in 24 hours may delay the ship date. Do you have a specific idea in mind? Want a different size? Each piece is 100% customizable-fonts, layout, graphics, embellishments, colors-YOU CHOOSE. 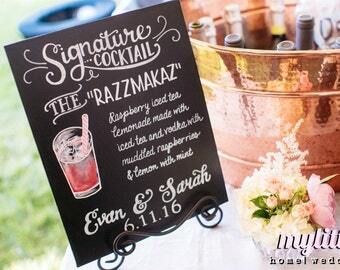 I will work with you to create a sign that will blend seamlessly into your wedding decor. Do you have your own chalkboard? Send it to me, and I will add my artwork to it-price varies depending on size, convo me for more information. Each piece is created by hand, so naturally each piece may slightly vary from the next (such as the hand lettering, floral accents, border). Shipping is free to the Franklin, MA area-convo me for details. Disappointed is a generous way to describe our experience. The product did not arrive as intended, the vendor promised to make amends, and two months later the situation has not been resolved. We have now waited 60+ days for a replacement board without response. Proceed with caution! We bought 6 signs for our wedding and they are GORGEOUS! They looked beautiful in person, but wow, stunning in real life! Quality is amazing as well!!! Custom Hand Painted Chalkboard Canvas - ANY quote, song lyric, poetry lines, etc.